Tusheti had been all I’d hoped. But it’s conclusion signalled the beginning of the end of this 23,000 kilometre odyssey. My deadline for finishing this trip is now firmly on the horizon. Having returned from Tusheti in the last days of July, my intention to get to London by August 31 now seems absurdly close. I've moved with some pace this year, but the final dash to London is looking like the most frantic period yet. I left Tbilisi on the train, headed straight for Batumi - the Black Sea coastal city in Georgia’s west. Arriving late at night, I sauntered into the utterly decrepit Hostel Retro near the city center and squirmed through a restless, unairconditioned, mosquito infested night. A short walk in Batumi the following morning made me feel less guilty about leaving it so soon after arriving. A pleasant enough place, the small city has a gilded and debauched side to it that I wasn’t so eager to explore. Despite its reputation for ghastly weather - which I endured while in town - Batumi is a Black Sea playground for Russian and Saudi tourists. Its quaint streets are richly endowed with casinos, bars and cafes, and much of the hedonistic, more illicit pastimes of any port city of old. In the end, I was there more or less to leave it. Turkish soil is just 15 kilometres away. Early on my second morning in Batumi, I navigated my way through town with my compass and the imprint of the city map in my mind (my phone no longer working, I’m thoroughly enjoying the mysteries of travel without the aid of GPS and interactive maps) and found a ride to Trabzon, the first major town in Turkey. The border crossing, just 20 minutes from Batumi, was heinous. A seething mass of people had gathered during the Georgian guards’ lunch break, leaving hundreds of tourists and locals to be processed through the afternoon. It took hours, through a barely constructed border crossing dominated by frustrated travellers and jaded border guards. But soon, I was in Turkey, hurtling down the Black Sea coast towards Trabzon. It’s easy to tell you’ve entered Turkey: mosques dot every spare inch of land, pictures of Erdogan, the country’s increasingly autocratic strongman of a president, are ubiquitous: his effigy no less a representation of the state than the red and white flags that always fly next to it. I faced a slight conundrum when entering Turkey: the northeast of the country, through which I was passing, was suffering tremendous rainfall, causing widespread flooding and generally awful weather. The rain didn’t cease after I’d entered Turkey and made it to Trabzon mid afternoon. The conditions, combined with the decreasing amount of time with I have to get 4000 kilometres West to London, made the overnight bus to Istanbul too tempting. Perhaps I could have stayed longer in Turkey’s east. But in truth, the siren song of the Balkans - the place that first opened my mind to the virtues of slightly trickier travel - was calling me. Even if the weather held, I’d likely have kept moving. So, 16 hours through a stormy Turkish night, and I arrived at Istanbul’s behemoth central bus station, Otagar. The Blue Mosque casts its striking silhouette. I’m starting to enjoy arriving in cities or towns with zero preparation. I had not even a map of Istanbul - one of the world’s largest cities - nor a single word of Turkish on my tongue. But I had my compass and a friendly disposition, and the assumption that there’s always a helping hand around when you most need it. I wasn’t even sure where Otagar bus station was in the context of Istanbul’s endless sprawl. Or that I was even at Otagar, and not some other mysterious bus depot. So to compose myself before navigating my way towards the city’s old quarter, I sat in a local kebab store and ordered a strong Turkish coffee. The waiter, fortunately, spoke English: atypical for Turks, but entirely typical for people with his background. He was a Syrian refugee, having fled Aleppo in 2012 after the worst of the Syrian War decimated the city. I never caught my waiter’s name. But we talked about the war, about the Syrian community in Istanbul, about Australia. My new friend was stubbornly optimistic that he’d return to his home soon. But I’m not so sure. The Syrian Civil War has been effectively won by Assad. I can’t imagine those who have fled will be so kindly received, even if peace truly returned to the broken nation. My Syrian friend spoke fondly of his home town. “In 2006, you should have seen it. People from all over the world there - France, England, America, Australia”. His nostalgia soon transitioned towards anger - directed towards ISIS primarily, as well as others in Syria who have inflamed tensions along sectarian lines. “They’re not Muslims”, he said of ISIS. “And a decade ago, we had no problems in Aleppo. It didn’t matter if you were Muslim, Christian or Jew, there were no problems”. Officially, 50,000 or so Syrians live in Istanbul. One hostel operator told me the real number is closer to half a million. It was no surprise, then, that my first interaction with an Istanbul resident was with someone who’d sought refuge in it. My Syrian friend showed me a map of the city, returning my bearings, and I trundled off - compass in hand and map on the mind - towards the metro. Istanbul is a beautiful city. Its setting is striking and historically fascinating; its buildings and lanes and boulevards a vibrant blend of old and new. It’s richly multicultural in every sense of that word. People from all over tread its cobbled streets - Saudis brush shoulders with Sudanese, Chinese with Russians, English tourists with their South African counterparts. Similarly, women wearing full burqas stroll unassumingly past young women far more at risk of a full-body sunburn. Men wearing finely woven traditional Afghan or Pakistani garb bump into shabbily dressed bumpkins such as myself. It is, as they say, a ‘melting pot’. It is also catastrophically busy. It shocked me. I hadn't been in a city this big since Beijing - but Beijing is a city of order. It was more reminiscent of Bangkok or Jakarta - a sprawling, over populated megalopolis straining and heaving and groaning under the weight of its own success. My two days in Istanbul were focused within the old quarter, near the Blue Mosque and other famous landmarks. I enjoyed the town and its fellow travellers, with whom I could really converse and drink and eat with. But there was also a bittersweet feeling being here. It signals the end of the line in terms of true hardship and difficulty on this trip. I'm now officially in Europe, having crossed the Bosporus. I’ve also entered a European summer, which will see me come face to face with fewer travellers engaged in glorious, life-affirming world-wide adventures, and more revelling in all the excesses that this continent has to offer its cashed-up clientele. This reality struck hard on night one in Istanbul. 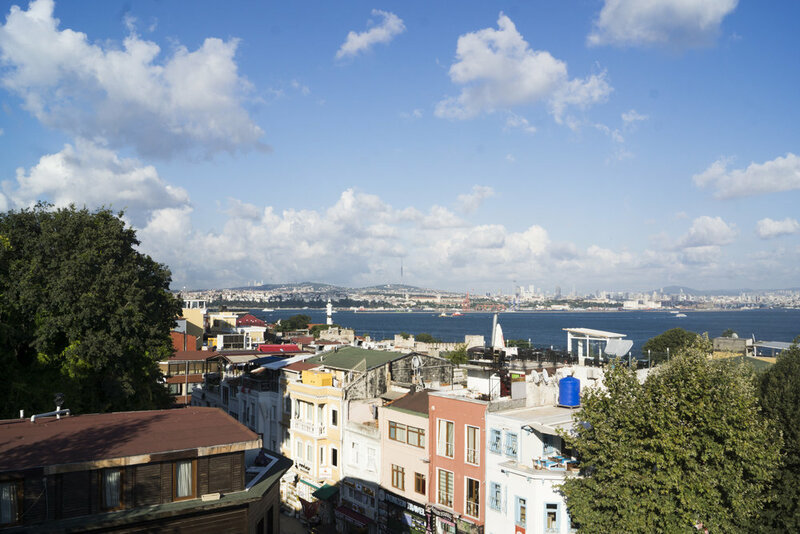 I was sitting on our hostel balcony, overlooking the Bosporus, and drinking some Efes lagers with another Australian, a soccer-fanatic from Denver, and a wily young Danish kid thirsting for adventure. Our conversation was engaging enough. The Australian had just returned from a work trip to Saudi Arabia and had stories to share. The Coloradan had enjoyed two months in Russia seeing World Cup matches, including the final. The Dane was eager to learn from us older travellers about the ways of a world he is aching to explore. The door to the balcony opened, and out came stomping a bombastic young Queensland girl from the Sunshine Coast. “Have youse boise been out here yet? Do youse know where ta go?”. No, we replied. We’re yet to venture “out”. “Ok no worries. We don’t know where to go, but the Turkish men are disgusting and scary”. Having left her racially insensitive charge awkwardly adrift mid-air, she returned to her Contiki-collective. In her hand sat some sort of flavoured vodka thing that looked radioactive and not particularly consumable. I’m old enough, and perhaps nerdy enough, to refer to such beverages as ‘alcopops’ - luxuries I hadn't seen a great deal of in the hard-spirit-drinking former USSR through which I’d tramped for some time now. I later overheard some of their neighbouring conversation. “Why do they call that side [of Istanbul] the ‘Asian side’?”, questioned one inquisitive partier, seemingly oblivious to the well-known, millennia long role Istanbul has played as the literal bridge between Europe and Asia - between East and West and Christianity and Islam. Something made me suspect that she hadn’t read Richard Fidler’s Ghost Empire, or explored the history of the Persian or Roman or Byzantine or Ottoman Empires or World War 1. Maybe she hadn’t even seen 300. But I too am no expert. And their high-spending, high-octane type of travelling is probably, in the end, far more valuable to Turkey than my super budget, fleeting dalliance. For better or worse, this is the world I have now entered. As each European mile passes under foot, the familiarities of home grow more common. But nevertheless, I’ll enjoy this last month on the road. I’ve a tent on my back and the experience of six months travel under my belt. The sun is, usually, shining. And for now, the mountains of southern Bulgaria are calling.